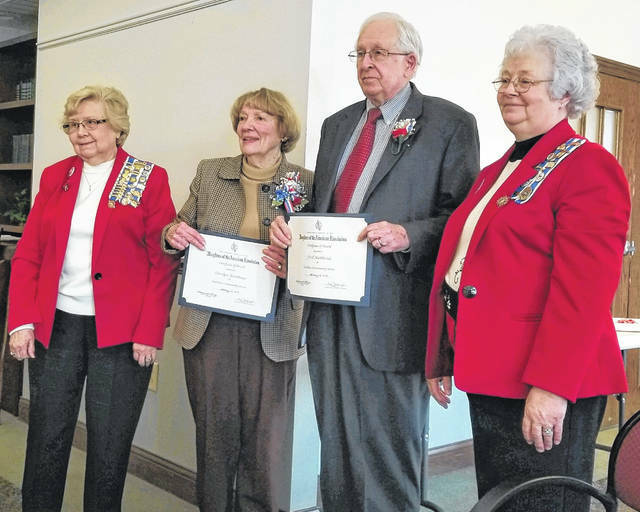 Frances Sharp, DAR Regent, with DAR Community Service Award winners Carolyn Matthews and Fred Matthews, and Judy Sargent, DAR Community Service Chair. From left are Susan Henry, Registrar; Frances Sharp, Regent; new member Amy Wells Miller; and Barbara Scarboro, Chaplain. DAR Outstanding American History Teacher is Tony Blevins, shown with Frances Sharp, DAR Regent, and Bonny Kanyuck, DAR Historian. 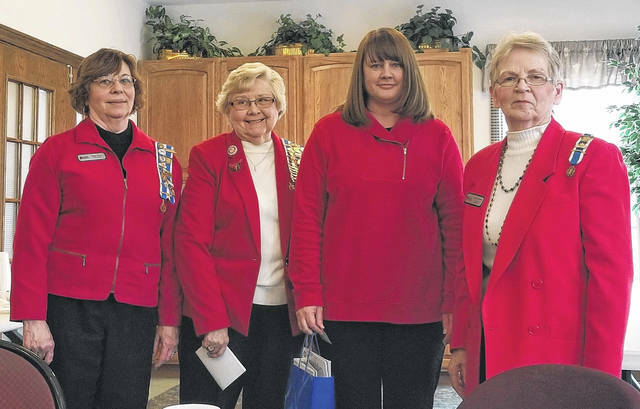 WILMINGTON — The George Clinton Chapter of the National Society Daughters of the American Revolution met at the Cape May Conference Center Feb. 16 with 30 members and three guests in attendance. Hostesses were Linda Bledsoe, Linda Lee and Kay McIntyre. Frances Sharp, Regent, opened the luncheon meeting with a welcome and introduction of guests. The DAR Ritual followed. Each year the George Clinton Chapter presents the DAR Community Service Award to an individual(s) for outstanding unpaid voluntary achievements to the community. Judy Sargent, Community Service Chair, introduced Carolyn and Fred Matthews, the 2018 award recipients. Carolyn Matthews served on the Wilmington College Board of Trustees for 12 years; the committee to plan the Quaker Heritage Center; member of the Health Alliance Board of Directors and active in planning its annual holiday ball; the Clinton County Zoning Board; arranged over 80 centerpieces for the annual Dinner in the Fields; served on Wilmington Friends Meeting committees including hospitality, greeting and nominating plus decorating the church for Easter and Christmas. She is a member of Yani, Conversation Club, Decorative Arts Society of Cincinnati, DAR, and in 2007 was honored as an Outstanding Woman of Clinton County. Fred Matthews was active in building the first housing for senior citizens and a member of the governing board for 10 years serving as clerk of that board for three years. He has played percussion in the Clinton County Community Band for over 25 years; served and is serving on his church’s trustee committee; taught a travel class for the Wilmington College Institute for Lifelong Learning; and is a 50-year member of Kiwanis where he served in major offices. Fred and Carolyn have served on the Leadership Clinton Board, The Streamkeepers, an environmental organization, and were involved in the refurbishing of the Murphy Theatre. The Outstanding Teacher in American History award may be given annually by DAR chapters to recognize a notable full-time teacher of American History (and related fields such as social studies, government or citizenship education) in grades 5-12. 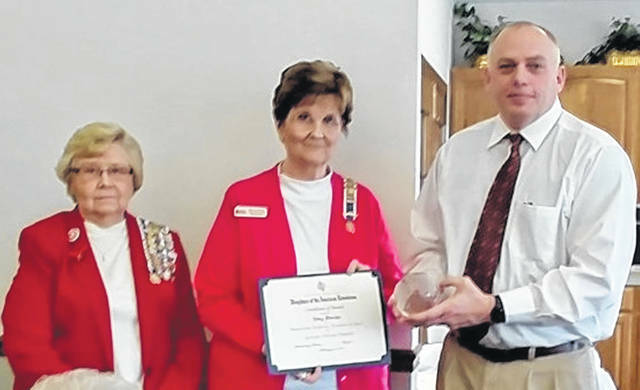 Tony Blevins from Blanchester High School was presented this award along with a gift of a crystal globe paperweight by Historian Bonny Kanyuck. A letter of support by one of Mr. Blevins’ former students was read citing his experiences in the classroom which drew him to become a history teacher himself. Mr. Blevins will also be awarded the Ohio Society DAR History Teacher of the Year Award at the DAR State Convention later this month. Following the presentations, Amy Wells Miller was welcomed as a new member by the Regent, Chaplain Barbara Scarboro, and Registrar Susan Henry. The President General’s Message was given by Joyce Peters who noted that the DAR Library recently completed an updated catalog which features a new simplified user interface with the capability for advanced searching and browsing. Leslie Holmes gave the National Defense report about Sgt. Perry Loyd, a World War I soldier who was recognized posthumously on Oct. 13, 2018 with the Purple Heart. During the Conservation minute, Linda Hamilton described areas of native wildflowers planted along the interstates which attract bees, kestrels, field sparrows, meadowlarks and other birds. Lady Bird Johnson was the force behind the Highway Beautification Act in 1965 which laid the ground work for these areas of natural beauty. During the Constitution Minute, Barbara Scarboro described the Constitutional Gardens, which includes a landscape dedicated to the 56 signers of the Declaration of Independence. The gardens are part of the National Mall area in Washington D.C.
Information on Mary Ross, a member of the Cherokee Nation of Oklahoma, was given by Suzanne Madison for the American Indian Minute. Mary Ross was the first Native aerospace engineer who was a member of the top-secret team which planned the early years of space exploration. She is now being honored on a special $1 US coin. Pat McKenzie reported on Tamasee DAR School, founded by the National Society, which is celebrating its 100th anniversary. The school serves as a children’s home and family service organization. For Women’s Issues, Karen Kratzer reported on women’s heart attack symptoms which are often different from those men. The Secretary’s report was given by Linda Barkey and the Treasure’s report by Shannon Peters. Linda Barkey reported that the chapter sponsored 135 wreaths for the 2018 Wreaths Across America Campaign which placed 1.8 million wreaths on service men and women’s markers. The meeting concluded with a memorial service remembering 99-year-old Katherine Moore, a member of the chapter for over 50 years.